The Houla Massacre of a week ago in several small Muslim villages near the Syrian city of Homs underscores the tragic circumstances of civilian vulnerability to the brutal violence of a criminal government. Reliable reports confirm that most of the 108 civilians who died in Houla were executed at close range in cold blood, over 50 of whom were children under the age of 10. It is no wonder that the Houla Massacre is being called ‘a tipping point’ in the global response to this latest horrifying outbreak of Syrian violence, a process that started over 15 months ago. The chilling nature of this vicious attack that refused to spare the most innocent among us, young children, does seem like a point of no return. What happened in Houla, although still contested as to details, seems established as mainly the work of the Shabiha, the notorious militia of thugs employed by Damascus to deal cruelly with opposition forces and their supposed supporters among the Syrian people. This massacre also represents a crude repudiation of UN diplomacy, especially the ceasefire 280 unarmed UN observers have been monitoring since it was put into effect on April 12th. In this regard the events in Houla reinforced the impression that the Assad regime was increasingly relying on tactics of depraved criminality and state terror to destroy the movement that has been mounted against it. Such defiance also created new pressure on the UN and the international community to do something more interventionary than bemoaning and censuring when confronted by such evil, or face being further discredited as inept and even irrelevant. that casts a dark cloud over Syria’s future. With a certain amount of fanfare in Israel and Palestine, although still severely underreported by the world media and relatively ignored by the leading watchdog human rights NGOs, it was observed with contradictory spins that the Palestinian hunger strikes had been brought to an end by agreement between the strikers and Israel. At least, that is what most of us believed who were following this narrative from outside the region, but like so much else in the region our understanding was a half-truth, if that. Whether Israel abides by its assurances remains to be seen, and although these strikes were courageous acts of nonviolent resistance it is not clear at this point whether they will have any longer term effects on the Israel’s occupation, arrest, and prison policy, or on the wider Palestinian struggle. The recent parallel hunger strikes in Israeli prisons reignited the political imagination of Palestinians around the world, strengthening bonds of ‘solidarity’ and reinforcing the trend toward grassroots reliance on nonviolent resistance Israeli abuses. The crisis produced by these strikes made this year’s observance of Nakba Day a moral imperative for all those concerned with attaining justice and peace for the long oppressed Palestinian people whether they be living under occupation or in exile. The Palestinian mood on this May 14th, inflamed by abuse and frustration, but also inspired by and justly proud of exemplary expressions of courage, discipline, and nonviolent resistance on the part of imprisoned Palestinians who are mounting the greatest challenge of organized resistance that Israel has faced since the Second Intifada. The agreements ending the strikes were reached as a result of Israeli concessions, pledges to reduce reliance on administrative detention, abandon solitary confinement, and allow family visits, including from Gaza. Whether these pledges will be honored remains to be seen. Past Israeli behavior whether with respect to Israeli settlement activity or with respect to softening the impact of the blockade on Gaza that has been maintained for five years suggest that only careful monitoring will determine whether Israel abides by its commitments. The experience of Hana Shalabi is not encouraging. In an agreement that ended her hunger strike after 43 days in exchange for her release from administrative detention, she was not allowed to return to her West Bank home but sent to Gaza and ordered to remain there for three years. Remember that there are two devils: one hangs out in the details, the other in the degree to which behavior corresponds with the pledges. As of now, the outcome of these hunger strikes have been justly celebrated as a victory for Palestinian resistance, and a further demonstration that at this stage the political struggle against Israeli occupation depends on the will and creativity of the people, and not on the diplomatic skill of the leadership. Inter-governmental diplomacy of the sort associated with ‘the Oslo peace process’ and ‘the Quartet’s road map’ have provided a smokescreen to divert attention from Israeli expansionist ambitions for the past twenty years without moving the two sides one inch closer to a sustainable and just peace. Perhaps, the other good news for the Palestinians is the further decline of Israel’s global reputation. According to a BBC poll only Iran and Pakistan are viewed more unfavorably than Israel among the 22 countries ranked, suggesting the utter failure of the expensive Israeli propaganda campaign. Even if Europe the unfavorable ratings associated with Israel are strikingly high: 74% Spain, 65%, France, 69% Germany, 68% Britain. What calls for explanation is why these European governments and the European Union ignore such a mandate from their own citizens, and continue to pursue policies that are unconditionally pro-Israeli. There are other signals of a shift in the diplomatic balance of forces. According to another new poll 61% of Egyptians want to cancel the 1979 Treaty with Israel. This is reinforced by the resentment of Egyptians toward the United States’ role in their country in the Middle East generally. 79% of the 1000 Egyptians interviewed expressed their unfavorable view of the United States. Where are the Israeli ‘realists’ hiding? Instead of loose talk about attacking Iran isn’t time to give weight to such recent developments? The writing is on the wall. Military superiority and political violence do not ensure security in the early 21st century. Legality and legitimacy matter more than ever. It is Turkey that exerts regional influence, not because it throws its weight around, but because it has, despite some serious flaws, pursued a path that has brought greater prosperity at home, acted independently and effectively in fashioning its foreign policy, and achieved a governing style reflective of its cultural identity. These achievements generate a Turkish Model that is attractive, overlooking unresolved acute problems with minorities and a clumsy kind of unwillingness to respect dissenting voices. Reverting to the Palestinian epic hunger strikes that continue to deserve our attention and admiration. It all started when a lone prisoner, Khader Adnan initiated a hunger strike to protest his abusive arrest and administrative detention on December 17th, which happens to be the exact anniversary of the day that the Tunisian vendor, Mohammed Bouazizi, set himself on fire, his death leading directly to a wave of uprisings across the region that became known throughout the world as the Arab Spring. Adnan gave up his strike after 66 days when Israel relented somewhat on his terms of detention, and this was the same length of time that Bobby Sands maintained his hunger strike unto death so as to dramatize IRA prison grievances in North Ireland. It is not surprising that the survivors of the 1981 Irish protest should now be sending bonding messages of empathy and solidarity to their Palestinian brothers locked up in Israeli jails. What Adnan did prompted other Palestinians to take a similar stand. Hana Shalabi, like Adnan a few weeks later experienced a horrible arrest experience that included sexual harassment and was sent to prison without charges or trial four months after she had been ‘released’ in the Shalit prisoner exchange in October 2011. She too seemed ready to die rather than endure further humiliation, and was also eventually released, but punitively, being ‘deported’ to Gaza away from her West Bank village and family for a period of three years. Others hunger strikes followed, and now two types of hunger strike under way, each influenced by the other. The longer of the strike involves six protesting Palestinians who are in critical condition, with their lives at risk for at least the past week. Bilal Diab and Thaer Halahleh who have now refused food for an incredible 76 days, a sacrificial form of nonviolent resistance that can only be properly appreciated as a scream of anguish and despair on behalf of those who have been suffering so unjustly and mutely for far too long. It is a sign of Western indifference that even these screams seem to have fallen on deaf ears. The second closely related hunger strike that has lasted almost a month is an equally an extraordinary display of disciplined nonviolence, initiated on April 17th Palestinian Prisoners Day. By now there are reported to be as many as 2000 prisoners who are refusing all food until a set of grievances associated with deplorable prison conditions are satisfactorily. The two strikes are linked because the longer hunger strike inspired the mass strike, and the remaining several thousand non-striking Palestinian prisoners in Israel jails are already pledged to join the strike if there are any deaths among the strikers. This heightened prisoner consciousness has already been effective in mobilizing the wider community of Palestinians living under occupation, and beyond. This heroic activism gives an edge to the 2012 Nakba observance, and contrasts with the apparent futility of traditional diplomacy. The Quartet tasked with providing a roadmap to achieve a peaceful resolution of the Israel/Palestine conflict seems completely at a loss, and has long been irrelevant to the quest for a sustainable peace, let alone the realization of Palestinian rights. The much publicized efforts of a year ago to put forward a statehood bid at the United Nations seems stalled indefinitely due to the crafty backroom maneuvers of the United States. Even the widely supported and reasonable recommendations of the Goldstone Report to seek accountability for Israeli leaders who seemed guilty of war crimes associated with the three weeks of attacks on Gaza at the end of 2008 has been permanently consigned to limbo. And actually the situation is even worse for the Palestinians than this summary depiction suggest. While nothing happens on the diplomatic level other clocks are ticking at a fast pace. Several developments adverse to Palestinian interests and aspirations are taking place at an accelerating pace: 40,000 additional settlers are living in the West Bank since the temporary freeze on settlement expansion ended in September 2010, bringing the overall West Bank settler population to about 365,000, and well over 500,000 if East Jerusalem settlers are added on. Is it any wonder then that Palestinians increasingly view the Nakba not as an event frozen in time back in 1947 when as many as 700,000 fled from their homeland, but as descriptive of an historical process that has been going on ever since Palestinians began being displaced by Israeli immigration and victimized by the ambitions and tactics of the Zionist Project? It is this understanding of the Nakba as a living reality with deep historical roots that gives the hunger strikes such value. Nothing may be happening when it comes to the peace process, but at least, with heightened irony, it is possible to say that a lot is happening in Israeli jails. And the resolve of these hunger strikers is so great as to convey to anyone that is attentive that the Palestinians will not be disappeared from history. And merely by saying this there is a renewed sense of engagement on the part of Palestinians the world over and of their growing number of friends and comrades, that this Palestinian courage and sacrifice and fearlessness will bring eventual success and, in contrast, it is the governmental search for deals and bargains built to reflect power relations not claims of rights that seems so irrelevant that its disappearance would hardly be noticed. By and large, the Western media, especially in the United States, has taken virtually no notice of these hunger strikes, as if there was no news angle until the possibility of martyrdom for the strikers began at last to stir fears in Israeli hearts and minds of a Palestinian backlash and a public relations setback on the international level. Then and only then has there been speculation that maybe Israel could and should make some concessions, promising to improve prison conditions and limit reliance on administrative detention to situations where a credible security threat existed. Beyond this frantic quest by Israel to find a last minute pragmatic escape from this volatile situation posed by both hunger strikers on the brink of death and a massive show of solidarity by the larger prison population, is this sense that the real message of the Nakba is to underscore the imperative of self-reliance and nonviolence and ongoing struggle. The Palestinian future will be shaped by the people of Palestine or nothing. And it is up to us in the world, whether Palestinian or not, to join in their struggle to achieve justice from below, sufficiently shaking the foundations of oppressive structures of occupation and the exclusions of exile to create tremors of doubt in the Israeli colonial mindset. And as doubts grow, new possibilities suddenly emerge. recall Guevara’s illuminating comment. Only those with closed minds can read such words of devotion without feeling that the animating hunger of these Palestinians is for peace and justice, for love and dignity, and that their heroic strikes would have impossible without cherishing life and future freedom for the people of Palestine. On his seventy-third day of hunger strike, Thaer Halahleh was vomiting blood and bleeding from his lips and gums, while his body weighs in at 121 pounds—a fraction of its pre-hunger strike size. The thirty-three-year-old Palestinian follows the still-palpable footsteps of Adnan Khader and Hana Shalabi, whose hunger strikes resulted in release. He also stands alongside Bilal Diab, who is also entering his seventy-third day of visceral protest. Together, they inspired nearly 2,500 Palestinian political prisoners to go on hunger strike in protest of Israel’s policy of indefinite detention without charge or trial. Twenty percent of the Palestinian population of the Occupied Palestinian Territories have at one point been held under administrative detention by Israeli forces. Israel argues these policies are necessary to ensure the security of its Jewish citizens, including those unlawfully resident in settlements surrounding Jerusalem, Area C, and the Jordan Valley—in flagrant contravention of the Fourth Geneva Convention‘s Article 49(6), which explicitly prohibits the transfer of one’s civilian population to the territory it occupies. The mass hunger strike threatens to demolish the formidable narratives of national security long propagated by Israeli authorities. In its most recent session, the United Nation’s Committee for the Elimination of Racial Discrimination concluded that Israel’s policy of administrative detention is not justifiable as a security imperative, but instead represents the existence of two laws for two peoples in a single land. The Committee went on to state that such policies amount to arbitrary detention and contravene Article 3 of the Convention on the Elimination of All Forms of Racial Discrimination, which prohibits “racial segregation and apartheid.” Nevertheless, this apartheid policy has so far escaped the global condemnation it deserves. In general, Palestinian grievances are consistently evaded with the help of media bias that accords faint coverage to signs of resistance, including even this extraordinary non-violent movement mounted by Palestinian victims of institutionalized state abuse. Palestinians must abandon violence….For centuries, black people in America suffered the lash of the whip as slaves and the humiliation of segregation. But it was not violence that won full and equal rights. It was a peaceful and determined insistence upon the ideals at the center of America’sfounding. There is a stark contrast between the round-the-clock coverage given to Chen Guangchen, the blind Chinese human rights activist who escaped from house arrest to the safety of the US Embassy, and the scant notice given this unprecedented Palestinian challenge to the Israeli prison system that is subjecting the protesters to severe health risks, even death. What is more, such hunger strikes are part of a broader Palestinian reliance on a powerful symbolic appeal to the conscience of humanity in their quest for long-denied rights under international law. Said deprivations include a disavowal of a peace process that has gone nowhere for decades, while a pattern of settlement expansion has made any realization of the widely endorsed “two-state solution” increasingly implausible. The prolonged nature of the occupation also steadily transforms what was supposed to be a temporary occupation into a permanent arrangement best understood as a mixture of annexation and apartheid. In the face of this opportunity to place pressure upon Israel to comply with international law and human rights norms, the international community of governments and inter-governmental institutions has been grotesquely silent as Palestinians place their very lives at sacrificial risk. For its part, the United Nations’ most senior officials said nothing until a group of forty young protesters blocked the entrance of UN offices in Ramallah on 8 May, demanding the issuance of a statement on behalf of the hunger striking prisoners. Together with the help of a global social media campaign to trend #UNclosed, UN Secretary-General Ban Ki-Moon and UNRWA’s director Filippo Grandi have finally issued statements expressing deep concern. Grandi has gone the farthest to urge that Israel either provide trials for the detainees or release them, though his statement has been conspicuously removed from the Agency’s website. Let us recall that successful global nonviolent movements are not restricted to fasts and marches, but include the boycott, non-cooperation, and civil disobedience tactics deployed by Palestinians today. Though President Obama, encumbered as he may be by a domestic election cycle, may feel compelled to ignore Palestinian responses to his call, the rest of the world should not. Certainly, US-based and global citizens should demand that the Western media begin to act responsibly when dealing with injustices inflicted on the Palestinian people, and not sheepishly report human rights abuses only when committed by the adversaries of their state. The media itself is a tactical target and a residual problem. In solidarity with the hunger strikers, civic allies should address the institutional edifice upholding administrative detention. It extends from a discriminatory core and therefore its requisite treatment includes ensuring the enjoyment of internationally guaranteed rights; rights enshrined by the BDS call to action and reified by the movement’s steady and deliberate progression. My U. S. government, in this situation, is misguided and wrong wrong wrong…. John Hurson in Ireland has been keenly conscious of the affinities between the historic Irish hunger strike of 1981 and the ongoing Palestinian hunger strikes. He has travelled to Gaza on several occasions on humanitarian aid convoys, and is the founder of the on line Gaza TV News service. I suggested that we collaborate on an article that might recall the Irish experience, especially the parallels and the potential implications for the future of the Palestinian struggle. John Hurson ends his reflective essay with a comparison between the hardheartedness of Netanyahu and the British leader at the time, Margaret Thatcher. Although more than 30 years have passed since Bobby Sands and his nine fellow prisoners died as a result of carrying their prison protests to their ultimate point of no return. 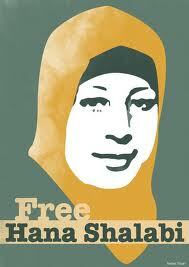 I hope and pray that no Palestinian hunger strikers die. Their moral authority and political energy is needed to galvanize further these glimmerings of a Palestinian awakening. 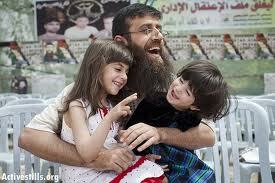 The impact of Khader Adnan and later Hana Shalabi, after their release from Israeli prisons is illustrative, and helps us all understand that although abusive arrest and administrative detention is the immediate cause of the hunger strikes, their agenda was always far broader than seeking personal relief. Their intention, already partially effective, was to shine a bright light of truth on the manner in which Israel has used administrative detention, as well as on broader concerns about Palestinian imprisonment more generally, and beyond this, to call attention to the unlawful and immoral denial through decades and across generations of fundamental Palestinians rights under a structure called internationally ‘occupation’ but experienced as a lethal blend of annexation, apartheid, and settler colonialism. At this time present medical condition of at least six long-term hunger strikers has been reported to be grave for the past several days. The respected Palestinian NGO, Addameer, gave details in its May 9th release entitled “Update: Situation of Long-Term Hunger Strikers Becomes Increasingly Urgent.” Those in critical condition include Thaer Halahleh and Bilal Diab (74 days); Hassan Shafadi (68 days); Omar Abu Shalal (66 days); Mohammad Taj (55 days); Jaafar Azzedine (51 days). There have been calls made for a worldwide empathy and solidarity hunger strike on Tuesday, May 15, the day that the Nabka is observed by Palestinians and their friends worldwide. I intend to make this gesture of support, and hope many others will join, and send a further message that the cause of Palestinian justice is rising to the top of the moral agenda of the peoples of the world even in the face of the awful complicity of Western governments with an intolerable situation of prolonged occupation and exile. The featured cartoon, suggested John Hurson, is by Carlos Latoof, the award winning Brazilian cartoonist who has so ofter memorably depicted the torments and tormentors of Palestine. In 1980, 7 IRA men in the H Block prison embarked on a hunger strike seeking to re establish their political status, which the British Government had ended 4 years before. After 53 days, and the men close to death, a deal was apparently on the table from the Thatcher led British Government, and the men called of their hunger strike. In the days that followed, it became clear that there was no deal. 2 months later, another hunger strike was announced, and on March 1st, Bobby Sands began his hunger strike. As part of their strategy, different men would join at later stages. Several men would follow Bobby, and by the end of the summer, 10 men had died before the hunger strike was called off. 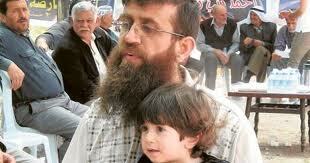 Khader Adnan ended his hunger strike after 66 days, the same length of time Bobby Sands endured before he died on May 5th 1981. 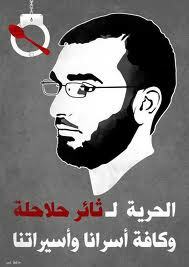 Throughout Khader’s hunger strike, he was compared to Bobby Sands, the first of ten men to die in the Hunger Strike of 1981. Forever, the 2 men will be talked about in the same breath for their courage, determination, and in Bobby’s case, ultimate sacrifice. At the beginning of March 1981, Bobby Sands began his Hunger Strike. He died on May 5th. Following Bobby, Francis Hughes, Ray McCreesh, Patsy O’Hara, Joe McDonnell, Martin Hurson, Kevin Lynch, Kieran Doherty, Thomas McElwee, and Mickey Devine all died before the strike was called off. As Khader Adnan approached the 50 day mark, I contacted Tommy McKearney and he recorded a message for Khader and his family. Tommy’s message carried a unique understanding of Khader’s condition as Tommy had gone 53 days without food in 1980. I contacted Oliver Hughes in South Derry. Oliver’s brother, Francis, died after 59 days, and his cousin Thomas McElwee after 62. Oliver recorded a very powerful message . As Khader was on his 64th day, I got in contact with the family of Ray McCreesh. They sent a statement of support for Khader and his family. Ray McCreesh (61 days), died on the same day as Patsy O’Hara. (61 days) Patsy ’s brother Tony sent a message of support on behalf of himself, and his mother Peggy. Mickey Devine was the last of the 10 men to die in 1981. Mickey’s children, Michael og and Louise, sent through a heartfelt message,. considering they were the same age as Khader’s children when their father died, their voices added a special meaning. Mickey Devine, (27), died on August 20th 1981 In addition to these messages, two other former hunger strikers added their voices. Pat Sheehan(55 days), and Ray McCartney (53 days), sent a video message. Danny Morrison, who was a friend of Bobby Sands also issued a statement. On day 66, Khader reached an agreement with the Israeli Government to end his strike on the condition that they would not renew his Administrative Detention order, and release him on April 17th. Following Khader’s hunger strike several other prisoners followed his example, and began hunger strikes in protest at their incarceration under the Administrative Detention policy. On April 17th, over 1,500 Palestinian prisoners initiated a mass hunger strike. The plight of the Palestinian prisoners was set to take centre stage, and their struggle brought to the worlds attention. In the days that followed, hundreds more joined them Adding a voice of support for Bilal Diab and Thaer Hallahla who were on day 70 of their hunger strike, was Laurence McKeown. Before ending his fast, he had gone 70 days without food. He knew only to well the dangers facing both men, and he recorded a message of support. Two days later, Pat Sheehan, MLA, issued a statement on behalf of Sinn Fein calling for an immediate end to Administrative Detention, and support for the prisoners. 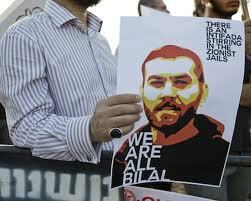 Bilal and Thaer are on day 74 day of their hunger strike. Ireland has a long history of the use of a hunger strike as a form of protest. It has been used for centuries. Palestinian prisoners have been inspired by Irish hunger strikes in the past, and this one is no different. In 1981, Palestinians prisoners sent a message of support to the families of the 10 men who died. Their memory burns bright among current prisoners on hunger strike. This hunger strike has resonated widely in Ireland. . The voices have roared around the world, playing a pivotal role in bringing international awareness and pressure on the Israeli Government, and their treatment of Palestinian prisoners. Historically, Ireland has had its fair share of tyrants. Amongst them, Margaret Thatcher is in a league of her own for allowing 10 Irish men to die on hunger strike before granting their 5 demands. Judging from his past behaviour, Netanyahu, like Thatcher in 1981, is unlikely to step in to avoid having any of these Palestinian die during their hunger strikes. Is the fuse being lit for a 3rd Intifada? Only the future will give us an answer.